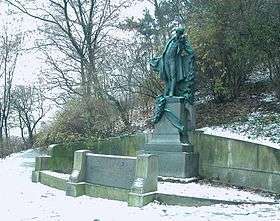 Karel Hynek Mácha (Czech pronunciation: [ˈkarɛl ˈɦɪnɛk ˈmaːxa]) (16 November 1810 – 6 November 1836) was a Czech romantic poet. Mácha grew up in Prague, the son of a foreman at a mill. He learned Latin and German in school. 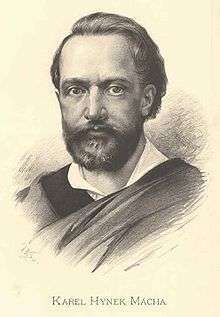 He went on to study law at Prague University; during that time he also became involved in theatre (as an actor he first appeared in Jan Nepomuk Štěpánek's play Czech and German in July 1832 in Benešov), where he met Eleonora Šomková, with whom he had a son out of wedlock. He was fond of travel, enjoying trips into the mountains, and was an avid walker. Eventually he moved to Litoměřice, a quiet town some 60 km from Prague, to prepare for law school exams and to write poetry. Three days before he was to be married to Šomková, just a few weeks after he had begun working as a legal assistant, Mácha overexerted himself while helping put out a fire and soon thereafter died of pneumonia. The day after his death had been scheduled as his wedding day in Prague. Mácha was buried in Litoměřice in a pauper's grave. Recognition came after his death: in 1939, his remains were exhumed, and they were given a formal state burial at the Vyšehrad cemetery in Prague. A statue was erected in his honor in Petřín Park, Prague. In 1937 a biographical film, Karel Hynek Mácha, was made by Zet Molas (a pen name of Zdena Smolová). Lake Mácha (Czech: Máchovo jezero) was named after him in 1961. Macha was honored on a 50 Haleru and a 1 Koruna stamp on 30 April 1936, Scott Catalog # 213-214. The stamp depicts a statue of Macha that is found in Prague and was issued by the postal agency of Czechoslovakia ('Československo'). He was again honored on a 43 koruna postage stamp issued by the postal agency of the Czech Republic ('Česká Pošta') on 10 March 2010. This 43 koruna postage stamp is presented on a miniature souvenir sheet. The Scott catalog number for this postage stamp honoring Macha is Scott #3446. His lyrical epic poem "Máj" (May), published in 1836 shortly before his death, was judged by his contemporaries as confusing, too individualistic, and not in harmony with the national ideas. Czech playwright Josef Kajetán Tyl even wrote a parody of Mácha's style, "Rozervanec" (The Chaotic). "Máj" was rejected by publishers, and was published by a vanity press at Mácha's own expense, not long before his early death. Josef Bohuslav Foerster set May for choir and orchestra as his Op.159. Mácha's genius was discovered and glorified much later by the poets and novelists of the 1850s (e.g., Jan Neruda, Vítězslav Hálek, and Karolina Světlá) and "Máj" is now regarded as the classic work of Czech Romanticism and is considered one of the best Czech poems ever written. It contains forebodings of many of the tendencies of 20th-century literature: existentialism, alienation, isolation, surrealism, and so on. Mácha also authored a collection of autobiographical sketches titled Pictures From My Life, the 1835–36 novel Cikáni (Gypsies), and several individual poems, as well as a journal in which, among other things, he detailed his sexual encounters with Šomková. The Diary of Travel to Italy describes his journey to Venice, Trieste, and Ljubljana (where he met the Slovene national poet France Prešeren) in 1834. The Secret Diary describes his daily life in autumn 1835 with cipher passages concerning his relationship with Eleonora Šomková. 1 2 3 4 Marcela Sulak, "Introduction," in Mácha, Karel Hynek (2005). May. Marcela Sulak (trans.). Prague: Twisted Spoon Press. pp. 7–18. ISBN 80-86264-22-X. Wikimedia Commons has media related to Karel Hynek Mácha.